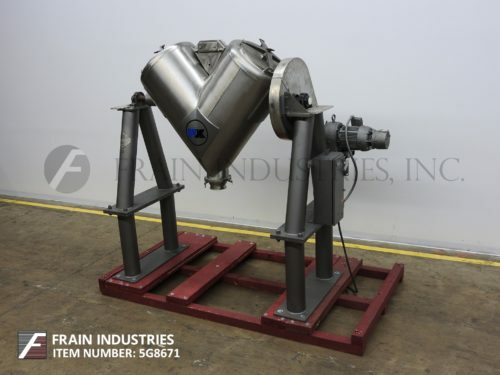 Patterson Kelly, 5 ft³, 304 stainless steel, twin shell mixer. Rated to 95 lbs per ft³ and Ibs per hour – depending on materials, application and machine configuration. Equipped with (2) 19" ID product ports with bolt down covers, (2) 35" long side V-Walls and (2) 13" long inner V-Walls. 5¾"ID butterly valve discharge with 17" ground clearance and powered by ¾ Hp drive. Requires 70" ceiling clearance with 25" swing radius / 50" swing diameter. Mounted on painted A-Frame style base frame.